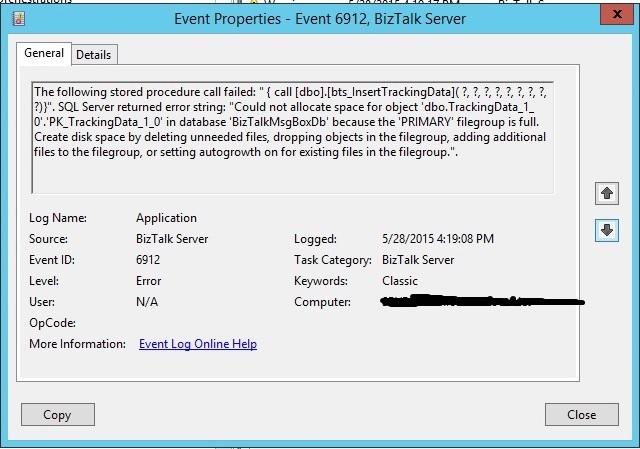 As can be interpreted from error message, the allocated space for BizTalkMsgBoxDb was full. 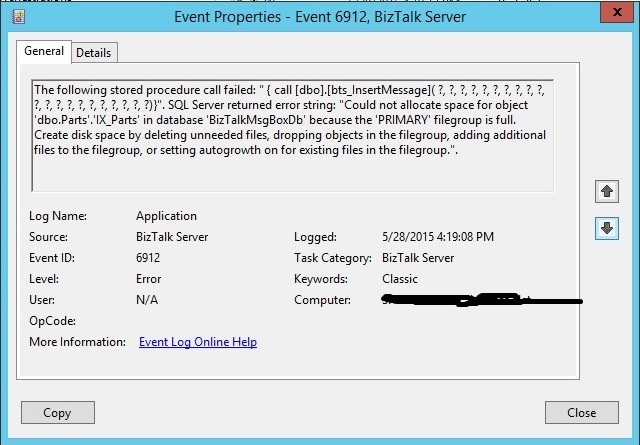 The first thing was to check if AutoGrowth is enabled or not on BizTalkMsgBoxDb, and it was. Then had a look at the jobs and found that DTA Purge and Archive Job was disabled since a week (don't know how) and that was the reason for this issue. So to fix the issue, reconfigured the job and enabled it and also purged the Tracking database. Welcome to eleventh interview of the series, today's expert is Nino Crudele. He is full of passion for integration world and he likes to use all possible technologies to do that, Microsoft Azure, Event Hub, Stream Analytic, BizTalk Microservices, BizTalk Server, and all possible Integration technologies patterns. Nino Crudele has been an BizTalk MVP for 7 years, besides that he is also a Virtual Technology Specialist for BizTalk Server, a role in which he works closely with Microsoft. He enjoys this role as it enables him to work with many different clients seeing BizTalk in different scenarios from a technical point of view, size, and criticality. He developed the famous BizTalk Visual Studio NoS Addin. Nino has worked with most of the BizTalk accelerators, Rosettanet, HL7, SWIFT and has done some big projects on EDI and RFID. In the past he also had the opportunity to be part of a big integration project with a major Italian enterprise organization that integrates many technologies like SAP, AS400, TIBCO and others using BizTalk. MCTS BizTalk Server, MCT, MCAD and MCSD. Nino: I’m Nino Crudele, I have three amazing children Rebecca, Carolina and Riccardo, one wonderful wife, Grazia, and my life is totally focused on them. I have been Application Integration MVP for 8 years, I’m working in Solidsoft Reply as Application Integration Specialist. I like sports as Kayak and Skateboard, when I need to relax I just like to take a run with my skateboard, I also like to read about maths, science and play Chess. Nino: I start many years ago using BizTalk Server 2002 version and I have a good memory about this time. Nino: I was really lucky about it because I worked for many years as Virtual Technology Specialist for Microsoft and I had the opportunity to do a lot of different things with BizTalk. I used all the adapters and accelerators and I followed a lot of different critical missions, this was a good way to improve my knowledge. Nino: I worked in many different projects and for all the biggest companies in Italy, I have many different and interesting situations to speak about, some of them because using hundreds of CPUs or BizTalk boxes other because using a lot of different accelerators and adapters. Nino: Good question and not so simple to answer, I think that BizTalk is the most complete and solid platform that Microsoft has developed, I really love BizTalk Server and my opinion is not because I’m Microsoft MVP but because it is real. I used other integration platforms but BizTalk Server is the only one which able to cover all the most important aspects, for example reliable, correlation and transaction (SAGA), in very easy way. Nino: A BizTalk expert is a person who able to know all about the product and how to solve problem using it, he also needs to have a very good vision about integration scenarios and different technologies. BizTalk runs on SQL Server, Windows resources, network, he has a lot of different features inside which use IIS, Disk I/O, and BizTalk has hundreds of adapters and thousands of setting to know. An Integration expert needs to know a universe of things and BizTalk is one part of these. Nino: I think that all of these things are important to share knowledge, I like to write article and share, this is the best option we have to merge our passion. Nino: My best advices are:Keep calm, sit and start understanding the engine, BizTalk is not a complicate thing and there is a lot of good documentation and books in internet. How it works, Publish / Subscribing and Message context. 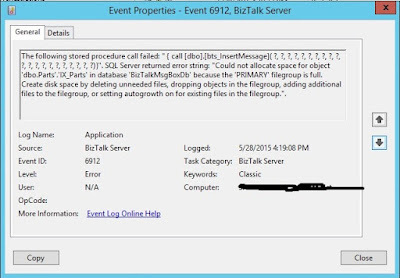 Mahesh: What is a BizTalk Host and Host Instance? Nino: Don’t start developing because drag and drop and don’t force yourself using only BizTalk things, you are a developer, and you have also to use code. 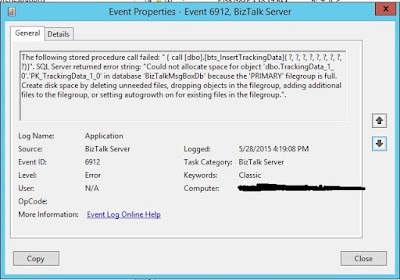 Understand the BizTalk domain and what it means developing and using an own external library and how to manage it in the best way, in term of monitoring and errors. Nino: Is a good option to certify your capabilities. Nino: BizTalk is a great product and I think it will be present for a long time. I like to say that the power of Azure is directly proportional with the summation of things that we are able to combine together. I think about Azure as a little universe full of things and the collision between them is able to create energetic solutions. The world of integration is huge and we have many different options to solve problems, I’m working in this new engine, JiTGate (Just in Time Gate), it is able to use all of these things together to integrate technologies in very easy and fast way, I’m in a good point with the development and I hope to release a version soon. Nino: I think the knowledge That Has to be free and not drove by the main actors, I'm not just speaking only about technology but about all, we have to be free to share and help people to understand and to live a better. Mahesh: Being MVP, do you feel that responsibilities get added? What is your thought on MVP? Nino: Yes I’m feeling the responsibilities to be a MVP, it is a big thing, the MVP family is full of great persons and I’m honoured to be part of this. Thanks a lot Nino for great insights, this will surely benefit many !!! Feel Free to ask questions to Nino in the comments!!!!!!! !